So, 150 grounds up for me. Quite a milestone, really, but how to celebrate? The bottom club in the League of Wales is an option. Not for me a fanfare reception at a pro ground, waving to four disinterested stands from the centre-circle as I accept a signed ball from the local radio breakfast DJ who doubles as matchday announcer. Mind you, I can’t imagine any club offering that (1000 grounds maybe? ), so I stick with the trip to the land of my fathers, or more accurately, the land of my maternal grandmothers, for while my old man was born in Bangor, he’s about as Welsh as a minimalist kabuki. My Nan though, proper Welsh, but I’ll bang on about my vague Welshness at some other stage. For now, let me tell you about ‘the Ancients’. Cefn Mawr, a tiny village south of Wrexham, is eerily deserted on a Saturday afternoon, a situation substantially mirrored on the terraces of their football club. Perhaps this is partly due to the bursts of hail that come shooting in sideways from the North, the almost perfectly spherical bullets causing a rush during the game for the little cover that the Plaskynaston Lane ground provides. However there is an odd feeling about the place, like a piper’s been through, y’know. 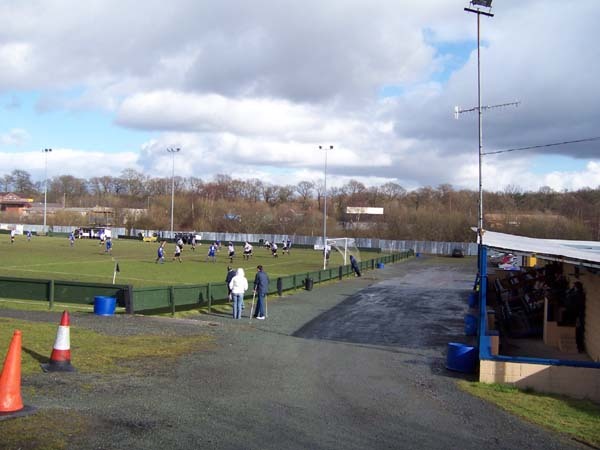 However, it should not be forgotten that this village houses a team that has played in the Welsh Premier League for six seasons. What is on show before us today is the highest level of football administered by the Football Association of Wales (we’ll ignore the six ‘rebels’ competing in the English pyramid), and therefore allows entry into Europe. Indeed Haverfordwest County played in this season’s UEFA Cup having finished 3rd in the Welsh Premier League last year. Heady stuff for a league often derided in England. Owing to a dispute over their council-owned Jenner Park stadium, they now also find themselves homeless and nomadic, turning out for ‘home’ games wherever they can. A sad tale indeed. To give an idea of how hard money is to come by in Welsh football, it seems that now having a company’s name on your shirt is no longer enough, the combined forces of Llansantffraid and Oswestry Town now competing as Total Network Solutions for example. Very successfully though, I might add, sitting atop the League of Wales as I write. Cefn Druids seemingly walk around Wrexham high street of a weekday with a sandwich board proclaiming ‘Prefix For Hire’. 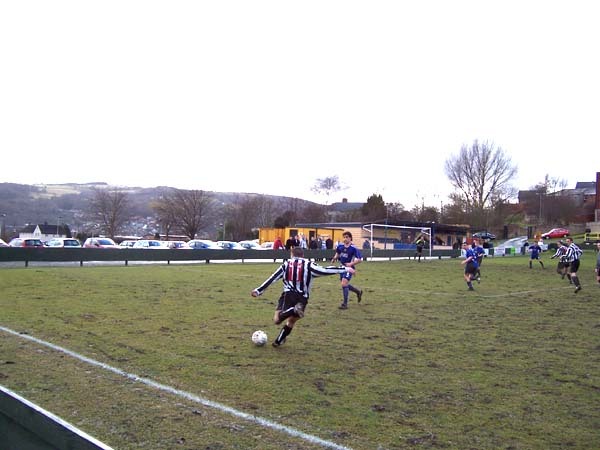 Having united Cefn Albion and Druids United in 1992, they added local firm Flexys to the top of their moniker at the start of 1998. 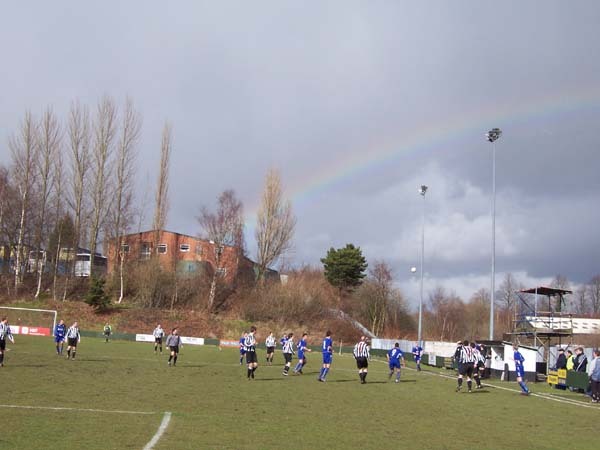 The cash influx must have helped as they were promoted to the Welsh Premier League from the Cymru Alliance the following season and have remained their since, although with precious little of this season remaining, relegation has begun to fold itself around their legs like particularly vicious quicksand. You might draw a comparison from this practice to the recent naming of new stadiums by Leicester and Arsenal solely after a sponsor, which you might say eats away at the soul and identity of a club (although I’m sure the clubs mentioned can cope). 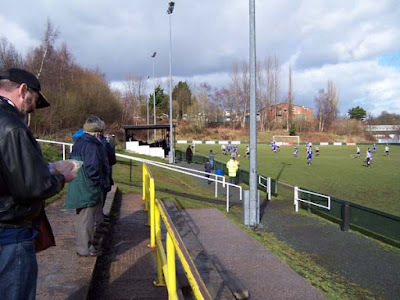 You can’t begrudge clubs like Cefn these initiatives though as while comparison may be drawn in the means of their money making, the ends are as polarised as it is possible to be. In financial dealings, clubs like Cefn are like a raggy old dog, head drooped forlornly over a paw, lying next to a threadbare, upturned flatcap littered with coppers and foreign coins. Your Arsenal’s are more your rotund felines in top hats smoking cigars. A 10 pence cup of tea is certainly not their poison. Nowadays Cefn Druids have repainted all livery to read NEWI, as they have struck a deal with the North East Wales Institute of Higher Education. It appears to be a reciprocal arrangement with resources made available to the Ancients and footballing opportunities given to students at the Wrexham based college. One such example of this two-way deal is Angel Jiminez, a Spanish-born midfielder who appears as a substitute in the second half. While his fellow countryman Juan Uguarte makes headlines up the road at the Racecourse Ground (scoring 5 goals in a game for Wrexham away at Hartlepool the previous week), Jiminez bottles tackles and falls over a bit. 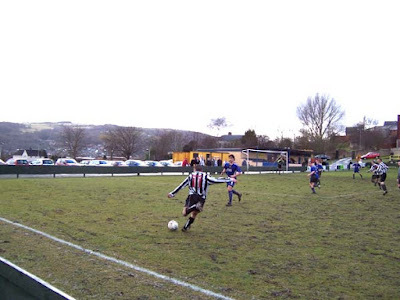 It is perhaps an adequate summary of their season and it is certainly no surprise that Haverfordwest County hardly break sweat in completing a 2-0 victory. Haverfordwest strike me as a club with too many syllables, making terrace chants a bit too much like hard work. Not that their support numbered many, let alone attempt to prick the peacefulness enveloping Plaskynaston Lane, but then the home side were not exactly packing them in either. In fairness no clubs in the League of Wales have set any world attendance records recently, but dipping below 100 is a rare thing in the Welsh top flight. However support needn’t be just about quantity, as of the 70 punters dotted around the ground, around 10 have travelled up from Exeter to watch their team. Well, their second team, perhaps third team, but don’t doubt their commitment. The students from Mardon Hall at Exeter University are on their 4th annual pilgrimage to Cefn Mawr and to a man are kitted out in the black and white stripes of the Ancients. They chant, they banter with the opposition keeper and generally have a grand old time. Their website also tells tales of drunken nights out in Chester and Wrexham bookending this fixture. It appears that a ‘Druids Til I Die’ competition has also been started by the 8 ever-presents thus far, with any trip missed resulting in them no longer being ‘alive’ in the contest. I’m liking the basic concept here. Get together with a group of mates, who all follow different clubs, and pick an easily accessible ‘foreign’ team you can all get behind. Perhaps we could apply this globally and end all racism and xenophobia as we all, as a species, pull together behind NEWI Cefn Druids. However I’m guessing that while 70 bods rattle around a bit inside Plaskynaston Lane, it’s not quite yet been granted the sufficient safety certificate to house the entire human race. I’m led to believe that Manchester United considered applying for that one though. my great uncle fred won the welsh cup with the druids. i notice you've visited 2 hufc's (including the mighty Hayling utd whose ground i have frequented)can i recommend a visit to edgar st, hereford- the whites are going up!